Ashley O’Brien was officially named the Bengals’ head women’s lacrosse coach in July 2018. 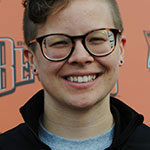 A former four-year standout goalkeeper for Buffalo State, O’Brien served a pair of stints as an assistant coach with the Bengals and acted as the interim head coach this past season, leading the team to a 7-11 record and a berth in the SUNYAC playoffs, while Lindsay Byrnes was on maternity leave. O’Brien first coached at Buffalo State as an assistant in 2012, and then rejoined the staff in 2014 before being promoted to associate head coach in 2017. She also spent two seasons as an assistant coach with Medaille College and worked at the club level with the Honeoye Falls-Lima Lacrosse Club as well as with the Buffalo Wings Lacrosse Club. During her playing career as a Bengal, O’Brien was named first team All-SUNYAC in 2009 and 2011, and to the SUNYAC All-Tournament Team in 2008 and 2009. The goalkeeper was also named the school’s 2008 First-Year Female Athlete of the Year. A native of Penfield, O’Brien earned her bachelor’s degree in biological psychology with a minor in athletic coaching from Buffalo State in 2011. She is currently pursuing a master’s degree in biology at Buffalo State.